Sarah Gobbs-Hill has directed the programming efforts of The Discovery since 2010 and is an active member of the museum’s Executive Leadership team, participating in strategic planning and annual goal setting. She oversees educational content for new exhibits, public and school programs, and professional development to support the educational mission and vision of The Discovery. Sarah took on the oversight of both the exhibits and programming departments at The Discovery in 2014 to ensure alignment with the museum’s educational goals. She now serves as The Discovery’s Vice President of Education and Exhibits. Most recently, Sarah collaborated with the rest of the education and exhibits team to create the museum’s first in-house temporary exhibition, Curiosity Carnival this past summer. When she is not facilitating exhibit projects, Sarah also leads the museum’s collaborations with many local partners to create impactful educational experiences for our visitors. For example, Sarah was instrumental in the creation of Science Distilled, The Discovery’s adult lecture series designed to bring contemporary scientific research to everyday audiences, in partnership with the Desert Research Institute. Sarah has experience teaching in both formal and informal settings and is a licensed teacher in Nevada, California, and Texas. She also participated in several fellowships since joining The Discovery and is always looking for ways to refine her knowledge of current educational practices. Sarah grew up in Helena, Montana where she spent much of her time exploring the outdoors. Although Montana does not have many museums, the state is known for its vast wilderness and beautiful scenery. In her free time, Sarah enjoys spending time outdoors, whether it’s camping, skiing or hiking. She also loves to cook and travel with her husband and two sons. 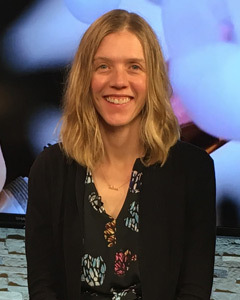 Sarah attended the University of San Francisco and graduated from Montana State University, Bozeman with degrees in Environmental Science and Spanish. She later earned an M.S. in Environmental Education from Colorado State University, completing a qualitative study focused on how informal science education can reach more audiences. Before completing her graduate studies, she taught 7th grade in an inner-city school in Houston, Texas as a corps member for Teach for America. Sarah has also participated in two fellowships: an intensive Sustainability in Science Museums Fellowship through the Walton Sustainability Solutions Initiative at Arizona State University, and an Open Education Resources (OER) Fellowship through the Institute of Study and Knowledge Management in Education (ISKME). Sarah’s participation in these fellowships enabled her to expand her knowledge in sustainability education, teaching strategies, and curricular resources while collaborating with industry professionals from around the country. Most recently, Sarah’s article, “What We Learned” was featured in Dimensions, an industry-leading publication distributed to over 500 science centers in 40 countries worldwide, discussing staff contributions to The Discovery’s collaborative exhibition, Curiosity Carnival. Curiosity Carnival was The Discovery’s first-ever exhibition experience produced entirely by museum staff, a project realized through Sarah’s leadership and coordination.